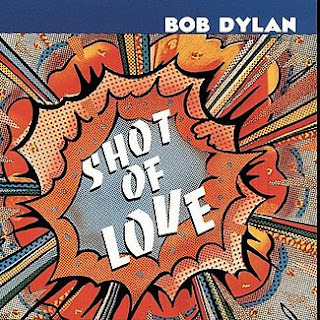 To begin with an obvious observation: Shot of Love is the most rocking of Dylan's trilogy of Christian themed albums. He gathered some of the finest rock session musicians around including Tim Drummond on bass (who played on Slow Train and Saved), Danny Kortchmar on guitar, Jim Keltner on drums, and Benmont Tench on keyboards. Ron Wood and Ringo Starr contributed to "Heart of Mine." "Shot Of Love" gets things off to a lively start. Dylan sings angrily "My conscience is beginning to bother me today" as he lists a litany of enemies trying to divert him off the righteous path. Beneath the bombastic performance lies a weariness and frustration. "Heart of Mine" is one of my favorite songs on Shot of Love. If was an A&R man, I might even hear a single. Actually it was a hit in Norway. There's no mention of religion either, a low key song about fear and heartbreak. "Property of Jesus" and "Watered-Down Love" are responses to those who mocked Dylan for his recent conversion. Dylan's tribute song "Lenny Bruce" feels a little random and yet appropriate. A hymn to a secular hero. Spiritual turmoil reigns on "The Groom is Still Waiting at the Alter" (not included on the original release) and "Dead Man, Dead Man." The final three songs move towards something of a finality. I would compare "Trouble" to "Political World", the opening track on Oh Mercy, a song even heavier on cynicism and despair written at the end of the 1980s. Even the harshest critics of Shot of Love acknowledged "Every Grain of Sand" as a masterpiece, Dylan's acerbic critic Robert Christgau even declared the song "canonical." Some compared the lyrical verse to William Blake. In the midst of despair he finds peace in the work of the "master's hand." The song goes on to mention a journey, the sense of falling off the path and struggling to get back on it. Temptation, painful memories, and anger will not go away, but he finds solace that "every hair is numbered like every grain of sand." As a symbol a lone Sparrow can be interpreted loneliness and sorrow- and that good things often come in small portions. In some cultures, prisoners get a sparrow tattoo when their sentence ends - a reminder to stay on the right path. Shot of Love begins in a fit of righteous anger and ends on a reflective note of courageous maturity. In the ensuing years, at the suggestion of his son Jesse, Dylan got enamored with punk and New Wave. In the 1980s he would make a few attempts to update his sound with mixed results. With Slow Train Coming, Saved, and Shot of Love we get a progression from the zealousness of the newly converted, introspective reflections on faith, and finally a return to worldly concerns with a new perspective tempered by age. All three offer a glimpse into Dylan's ever evolving world view. I find it so hard to listen to SOL (and Infidels) without thinking 'what might have been'. Leaving off Caribbean Wind and Angelina (and, initially Groom...) was such a killer. Really could have been up there as one of his best ever!